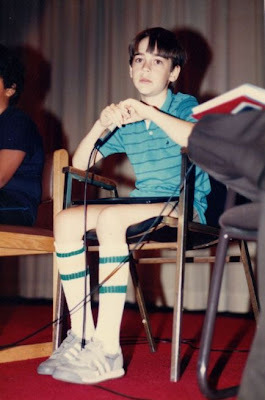 Some say he was the most talented child-actors of the 80s, who was on his way to become a major Hollywood player, and inevitable multi-millionaire. But after only 3 years of stardom, something changed and he pulled one of the greatest disappearing acts in movie history, never to come back. Barret Spencer Oliver was born in LA on August 24 1973. When a family-friend connected to the Biz "plugged" his big brother Kyle, in the late 70's, little Ollie decided on his own that he too wanted to be on the telly! Appearances in commercials (especially for Jell-O with The Coz) quickly led to juvenile guest parts in TV shows, like "Battlestar Gallactica" and "Knight Rider." 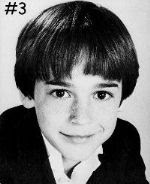 In 1982 alone, he was on the big screen in 3 different movies, before competing with 200 boys for a little fantasy movie called "The Neverending Story." Rejected for signs of immaturity, he was re-called 6 months later, when no suitable young man could be found, this time performing a knock out audition for director Wolfgang Petersen. The film was released in 1984, and young Oliver was fast becoming an international star. His increased exposure put him in the path of another former child-sensation, director Ron Howard (sometimes known as Opie). Howard was casting for 'Cocoon' when he saw "Neverending story", and quickly cast this younger version of himself as the movie's only child among a cast of geriatrics. In many promotional interviews, he spoke warmly of his bond with the director, and how he was taken under his wing. "Cocoon" was an instant heartwarming classic that even picked up 2 Oscars. His already hot status made him an easy choice for a much-anticipated sci-fi project called "D.A.R.Y.L. ", in 1985. Despite a deceiving tenure at the box-office, the movie, about a cybernetic child trying to fit in with a human family, generated the highest acclaims for Barret. Ironically, the experience left him with a bitter taste, and signaled a change of heart over his acting career. Not that he became arrogant or developed an oversized ego, but he realized, according to some of his cast mates, that child actors are seen, by director and adult actors, only as a tool for easy-money, and treated as such. The fact that becoming a teenager eroded his child-like cuteness only deepened the feeling. Now at 12, the young man decided to concentrate mainly on school, and started to refuse offers. He did return for a sequel to "Cocoon" (a lousy attempt to cash-in on the original's success), in 1988. The very next year, he would show audiences another side of himself. In "Scenes From The Class Struggle In Beverly Hills", starring Jacqueline Bisset, he plays a terminally ill teen that gets to fulfill his sexual fantasies. Whether he liked the role or not, it would be his last ever acting performance. After that, he completely vanished, without even a message to his fans, or an interview to explain why. Such a complete and abrupt disappearance gave way to a wide variety of wild and persistent rumors, giving the young man a mythical status. 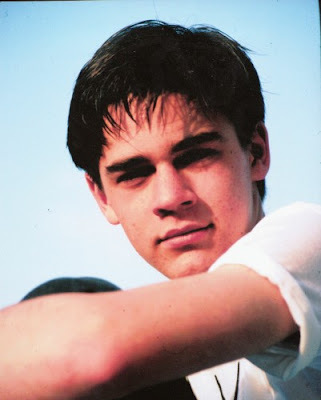 Some said that he fell into drug-related problems, others that he got into a cult (his father is said to be a Scientologist) and was subsequently brainwashed. Some tabloids even reported his involvement in some grizzly murder case. Not once did Barrett emerge to confirm or deny these rumors, or even give a clue on his whereabouts. An anonymous Internet poster, claiming association with him, stated a few years ago that he wanted his legend to live on, and so allowed false reports to continue. The first CONFIRMED update on his life came in early 2004. According to IMDb, Barret Oliver is now a Photography teacher in California, and one of the last disciples of the 19th Century "Wet Plate" photo technique. He apparently holds workshops and demonstrations about the craft, and has even written articles on the subject. One fan who visited his photo exhibition in California wrote on a fansite that "He has a full beard, wears glasses and has long hair. His voice was recognizable, he wasn't really tall, and spoke quietly." Whatever happened to him? He simply left, and doesn't show any signs of regrets or desire to come back. But if he ever did, would his fans forgive him for neglecting them so nonchalantly? By the way, he was mistakenly thought to have committed suicide in 2003. Many people confused him with the star of the SECOND "Neverending Story", Jonathan Brandis, who did take his own life last year, at the age of 27. I realize this may not be your opinion, only the general feeling of the brainless masses, but I have to say that Mr Oliver does not OWE his fans anything so there's nothing to forgive. This mentality that entertainers owe the audience their soul just irks me and I had to comment on it. "Barrett and I went to Apple School together and he eventually would go on to work at Scientology’s Celebrity Center International and finally was the Talent Chief at Golden Era Productions. He did not last long before he ended up bucking the system and being sent to the RPF at Happy Valley and then later routed out. Sandy divorced him while he was at Happy Valley..."
I really loved him,as also in his roles.I could relate in his movie roles alote.I was bullied and hid away from my problems just like the neverending story.I was a loner and loved to play baseball,but I stuck.also I loved and collected japanese robots and monsters and super heroes from japan.I later found out he visited japan.Daryl I loved growing up as a little boy.I wished he could've played in alote more.but I respect his retirement and his appearance as a adult.thanks! I was watching the movie D.A.R.Y.L with Barret Oliver, "Introducing Barret Oliver as D.A.R.Y.L" I realized, "Wow, what happened to this kid". As I suspected he grew into an adult. That always seems to be the case. But seriously for what ever reason he left the lime light it had to be something that money couldn't buy. Regrets would have probably been the case had he stayed in the business. Critics and fans are one of the worst forms of mental abuse. Fans feel as though they know you from seeing you on the big screen and the idiot box. Critic's have the responsibility of keeping people interested and many times its how they can get their name out there, so a good critic finds the good movies and picks on the bad acting. Mr. Oliver grew up, he safely escaped the peer pressure and the paparazzi and the gossip before it chewed him up and spit him out. In the end Hollywood blinked and he was gone. It was a smart choice, because he can jumpstart a career as an adult. Had he stayed who know's he could have ended up like some of the tragic Hollywood child actor stories. River Phoenix. Dana Plato, and the list goes on. The successful child/adult actors is a very thin list compared to the tragic list - that is ugly truth.